Microangiopathic hemolytic anemias and thrombocytopenias in pregnant or postpartum women constitute an interdisciplinary diagnostic and therapeutic challenge in the evaluation of thrombotic microangiopathies (TMA), where urgent care must be considered. We here report the case of a 21-year-old Somali woman, who was delivered by emergency caesarean section at 35 weeks of gestational age with acute dyspnea, placental abruption and gross edema due to severe preeclampsia/HELLP syndrome. After delivery, she developed acute kidney failure and thrombotic microangiopathy as revealed by kidney biopsy. The lack of early response to plasma exchange prompted extensive laboratory workup. Ultimately, the patient completely recovered with negative fluid balance and control of severe hypertension. This case report emphasizes the importance to differentiate between primary TMA syndromes and microangiopathic hemolytic anemias due to systemic disorders. Delayed recovery from preeclampsia/HELLP syndrome and malignant hypertension can clinically mimic primary TMA syndromes in the postpartum period. Microangiopathic hemolytic anemias and thrombocytopenias in pregnant or postpartum women constitute an interdisciplinary diagnostic and therapeutic challenge in the evaluation of thrombotic microangiopathies (TMA), where urgent care must be considered for immediate treatment particularly of preeclampsia/HELLP (PE/HELLP) syndrome, thrombotic thrombocytopenic purpura (TTP), and complement-mediated thrombotic microangiopathy [1–3]. We here report the case of a 21-year-old Somali woman, who was delivered by emergency caesarean section at 35 weeks of gestational age with acute dyspnea, placental abruption and gross edema due to severe PE/HELLP syndrome. This was her first pregnancy, which had been uneventful up to the 34th gestational week. Her soluble fms-like tyrosine kinase-1/placental growth factor ratio 2 days prior was 211.4 . After surgery, the patient was immediately transferred to Intensive Care Unit because of lung edema. The laboratory analysis revealed anemia of 7.4 g/dL, thrombocytopenia of 50 G/L, a negative coombs test, increased serum lactate dehydrogenase of 690 U/L, increased bilirubin of 2.2 mg/dL, elevated aspartate transaminase of 150 U/L, elevated alanine transaminase of 140, creatinine of 1.19 mg/dL, and no detectable haptoglobin levels (< 0.09 g/L). The peripheral blood smear showed manifold schistocytes (2.8%) and the activated prothrombin time was 38.2 s (Additional file 1: Table S1). The PLASMIC score was high indicating a high pretest probability for TTP (> 90%) . The patient displayed elevated systolic blood pressure between 160 and 200 mmHg despite of intensive blood pressure lowering medication including urapidil, nifedipin, furosemide, and dihydralazine. As concern for the diagnosis TTP was strong, we immediately initiated plasma exchange therapy (PEX) and glucocorticoid medication, and proceeded with further diagnostic evaluation over the next days (Fig. 1). While undergoing PEX, the renal retention parameters slowly increased over the next 4 days, reaching a serum creatinine level of 2.09 mg/dL and an estimated glomerular filtration rate of 33 mL/min/1. 73m2. In parallel, fibrinogen levels decreased to a nadir of 103 mg/dL, and the thrombocyte count was still as low as 35 G/L on the 4th postoperative day. This decrease was associated with a peak of D-dimer level (26.27 mg/L) on the 6th postoperative day. 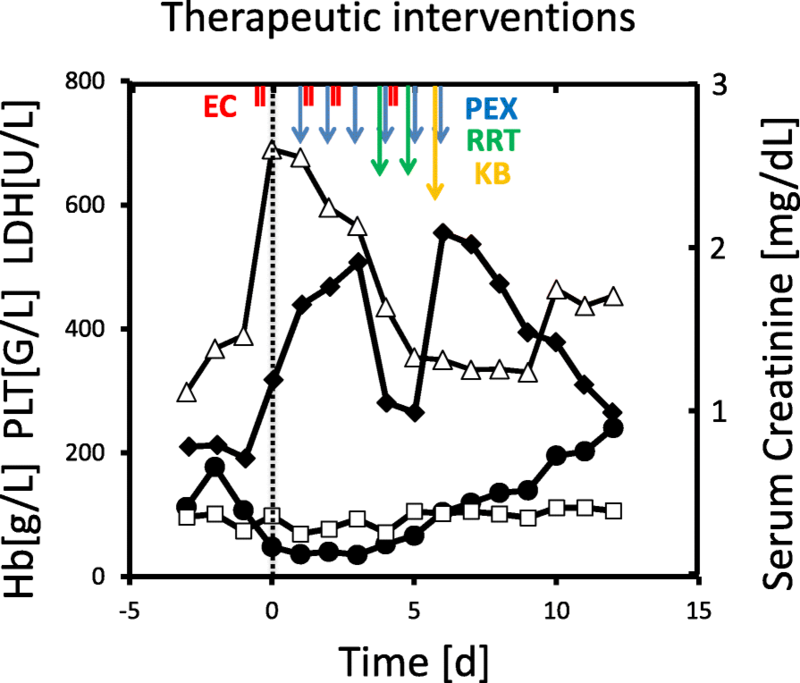 The lack of early response to PEX prompted us to discuss the need for anti-complement therapy with eculizumab and to seek for other causes of the patient’s symptoms. There was no retained placental rest after delivery. In the meantime, ADAMTS13 activity had been measured and was found to be only slightly decreased to 39–63%, thus excluding the diagnosis of TTP . Shiga-toxin, malaria parasites, and HIV antigen/antibodies were not detectable, and the hepatitis B and C serology tests were negative. The screening test for antibodies to extractable nuclear antigens (ENA), antinuclear, antiphospholipid and anticardiolipin antibodies, as well as serum C3c (0.917 g/L) and serum C4 levels (0.113 g/L) were within normal ranges. Urinary analyses revealed an albuminuria of 4.2 g/g and 40% acanthocytes, respectively. Since the patient presented with anasarca, somnolence, partial respiratory insufficiency due to lung edema and pleural effusions as well as still poorly controlled hypertension, we initiated a continuous renal replacement therapy with ultrafiltration on the 4th postoperative day, reducing the body weight of the patient from 70 kg to 49.5 kg in four days. Furthermore, PEX was daily continued. Along with the negative fluid balance of 20.5 L, the patient drastically improved both clinically and with the laboratory parameters. 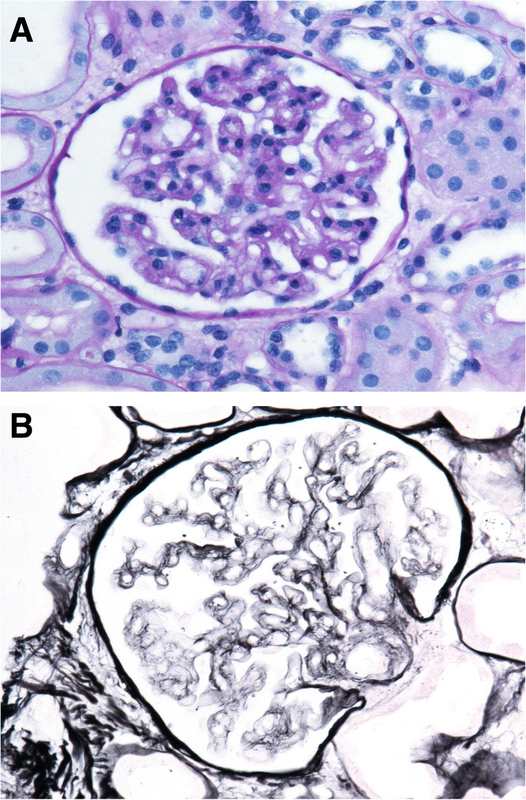 In parallel, kidney biopsy was performed on the 6th postoperative day, which revealed a residual thrombotic microangiopathy and signs of malignant hypertension such as doubling of the basal membrane as well as mild tubular necrosis. Immune complex nephritis, e.g. lupus nephritis, was excluded (Fig. 2). Therefore, we stopped PEX on the 6th day postpartum, after having reached a thrombocyte threshold of >100G/L. Dose and number of antihypertensive medication were drastically decreased. In a serum sample drawn prior to PEX, we found no evidence of complement activation using an in-vitro assay for complement deposition on non-activated endothelial cells (Fig. 3). C3c and C5b-9 complement deposition assays were performed as described previously by Noris et al. Moreover, there were neither anti-complement factor H antibodies as determined by ELISA, nor mutations of atypical hemolytic uremic syndrome-related genes ADAMTS13, C3, CFB, CFB, CFH, CFHR1, CFHR2, CFHR3, CFHR4, CFHR5, CFI, DGKE, MCP/CD46, MMACHC, and THBD as detected by next-generation sequencing . The patient completely recovered without further need for renal replacement therapy and/or PEX. Thrombocyte count increased to 240 G/L, and creatinine serum levels decreased to 0.99 mg/dL on the 12th day after delivery. The patient was discharged from Intensive Care Unit after 10 days, and dismissed from Hospital on the 16th day postpartum without any chronic impairment of glomerular filtration rate. Twenty-eight days after delivery, the glomerular filtration rate was 127.7 mL/min/1. 73m2, and serum creatinine was 0.64 mg/dL. Moreover, urinary albumin/creatinine ratio recovered from 4.2 g/g to 0.55 g/g within 4 weeks. The patient had given birth to a daughter who had an Apgar score of 8/9/10, a body weight of 2260 g (26th percentile), and a length of 46 cm. The daughter did not have increased perinatal morbidity. Ea.hy 926 cells (human endothelial cell line) were cultured in DMEM low Glucose medium (Gibco, Thermo Fisher Scientific, Waltham, MA, USA) containing 10% fetal bovine serum, Antibiotic-Antimycotic (Gibco, Thermo Fisher Scientific), and HAT Supplement (Gibco, Thermo Fisher Scientific) on cell chamber slides and used when confluent. C3c and C5b-9 complement deposition assays were performed as described previously. Briefly, cells were incubated with patient serum (1:2 dilution) or control serum for 4 hours. Cells were then stained with FITC-conjugated polyclonal rabbit anti-human C3c complement antibody (F0201, DAKO, Glosturp, Denmark) and monoclonal mouse anti-human C5b-9 antibody (ab66768, Abcam, Cambridge, MA, USA), followed by secondary antibody incubation with Rhodamine (TRITC)-conjugated goat anti-mouse (115–025-146, Jackson Immuno Research Laboratories, West Grove, PA, USA). Rb IgG Isotype Control FITC (PA5–23092, Thermo Scientific) and Mouse IgG2a Isotype Control (MCA929, Bio-Rad, Hercules, CA, USA) were used as appropriate isotype control antibodies. Stained cells were mounted with ProLong Gold Antifade Mountant with DAPI (Thermo Scientific). 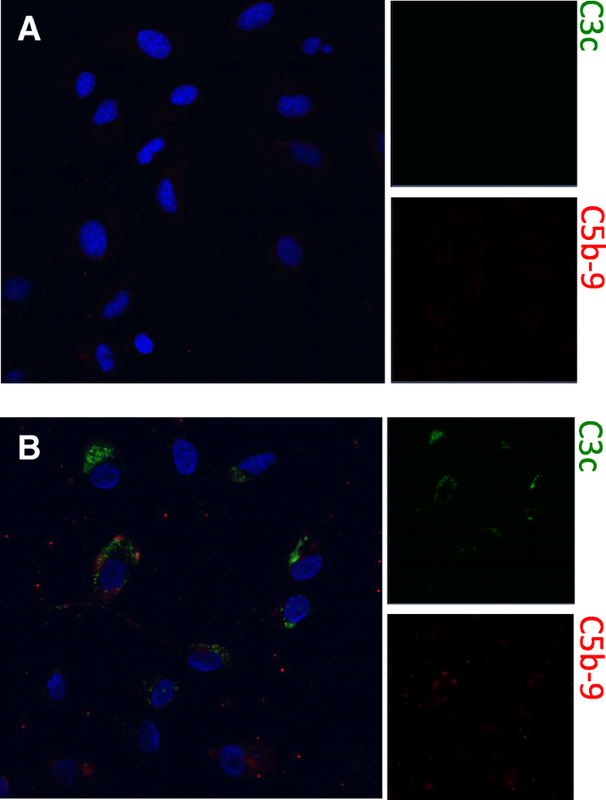 Evaluation of C3 and C5b-9 complement deposition on human endothelial cells was performed on a LSM 510 confocal microscope (Zeiss, Oberkochen, Germany). Taken together, this case report emphasizes the importance to differentiate between primary TMA syndromes and microangiopathic hemolytic anemias due to systemic disorders [3–5]. Delayed recovery from PE/HELLP syndrome and severe hypertension can clinically mimic primary TMA syndromes in the postpartum period. Since the diagnostic approach is costly in terms of time, it is nevertheless important to start standard therapy including PEX and revisit the first tentative diagnosis with the incoming diagnostic results as well as the clinical course of disease. K. Artinger was enrolled in the PhD program in Molecular Medicine at the Medical University of Graz. P. Eller and K. Eller received grant support by the Austrian Science Funds (FWF) (P27537-B26). The funding body did not have any role in the design of the study, and collection, analysis and interpretation of data and in writing the manuscript. ECW performed the Caesarean section, KE performed the kidney biopsy, MJP performed the histopathological stainings, KA performed cell culture and complement deposition assay, CM performed the genetic analyses for mutations of atypical hemolytic uremic syndrome-related genes. GS, GH, FE, and PE treated the patient on ICU. PE and KE analysed the data and wrote the manuscript. ECW, MJP, KA, CM, GS, GH and FE critically revised the manuscript for important intellectual content. All authors approved the final version of the manuscript and agreed to be accountable for all aspects related to accuracy and integrity of the work. The Institutional Review Board of the Medical University of Graz approved this clinical study (EK-Nr. : 29–471 ex 16/17). George JN, Nester CM, McIntosh JJ. Syndromes of thrombotic microangiopathy associated with pregnancy. Hematology Am Soc Hematol Educ Program. 2015. https://doi.org/10.1182/asheducation-2015.1.644. George JN, Nester CM. Syndromes of thrombotic microangiopathy. N Engl J Med. 2014. https://doi.org/10.1056/NEJMra1312353. Bruel A, Kavanagh D, Noris M, Delmas Y, Wong EKS, Bresin E, et al. Hemolytic uremic syndrome in pregnancy and post-partum. Clin J Am Soc Nephrol. 2017. https://doi.org/10.2215/CJN.00280117. Zeisler H, Llurba E, Chantraine F, Vatish M, Staff AC, Sennström M, et al. Predictive value of the sFlt-1:PlGF ratio in women with suspected preeclampsia. N Engl J Med. 2016. https://doi.org/10.1056/NEJMoa1414838. Bendapudi PK, Hurwitz S, Fry A, Marques MB, Waldo SW, Li A, et al. Derivation and external validation of the PLASMIC score for rapid assessment of adults with thrombotic microangiopathies: a cohort study. Lancet Haematol. 2017. https://doi.org/10.1016/S2352-3026(17)30026-1. Cines DB, Levine LD. Thrombocytopenia in pregnancy. Blood. 2017. https://doi.org/10.1182/blood-2017-05-781971. Noris M, Galbusera M, Gastoldi S, Macor P, Banterla F, Bresin E, et al. Dynamics of complement activation in aHUS and how to monitor eculizumab therapy. Blood. 2014. https://doi.org/10.1182/blood-2014-02-558296. Fremeaux-Bacchi V, Fakhouri F, Garnier A, Bienaimé F, Dragon-Durey MA, Ngo S, et al. Genetics and outcome of atypical hemolytic uremic syndrome: a nationwide French series comparing children and adults. Clin J Am Soc Nephrol. 2013. https://doi.org/10.2215/CJN.04760512.